Are you a wood mount stamper or a clear mount stamper? If you have any clear blocks you can use them to make a really interesting background. Did you know you can ink the block just as if it were a stamp and transfer the ink from the pad to the paper with the block. TIP: Use your clear blocks like a stamp. 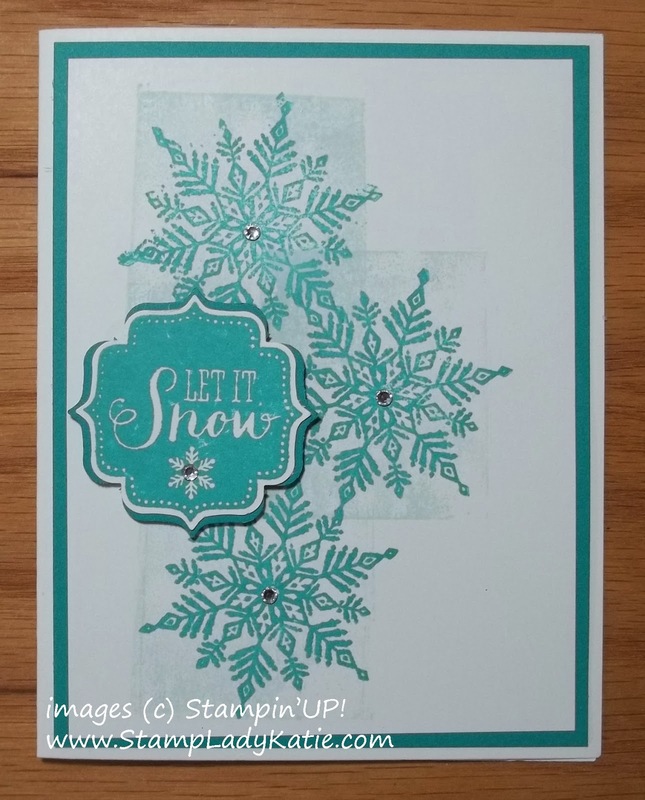 Can you see the light square of ink behind each snowflake on this card? 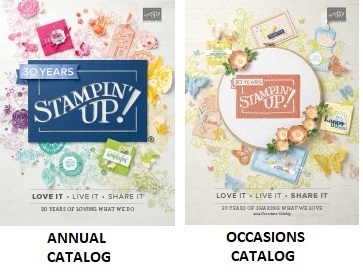 That square was made with Stampin'UP! 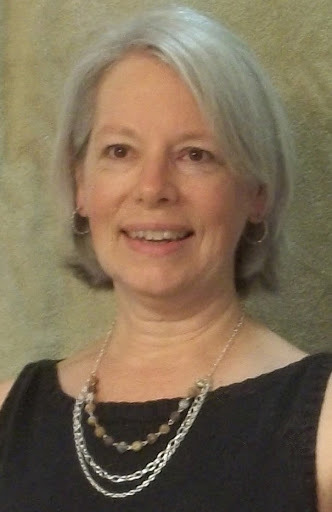 's "C" block. To see other cards I've uploaded using this technique click here: Acrylic Block Background technique. 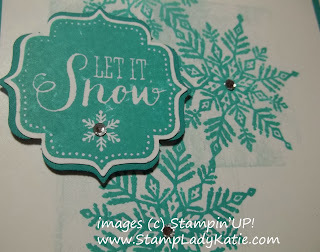 I love Stampin'UP! 's Rhinestone Jewels. These self-stick rhinestones are such an easy way to add a little sparkle to a project. 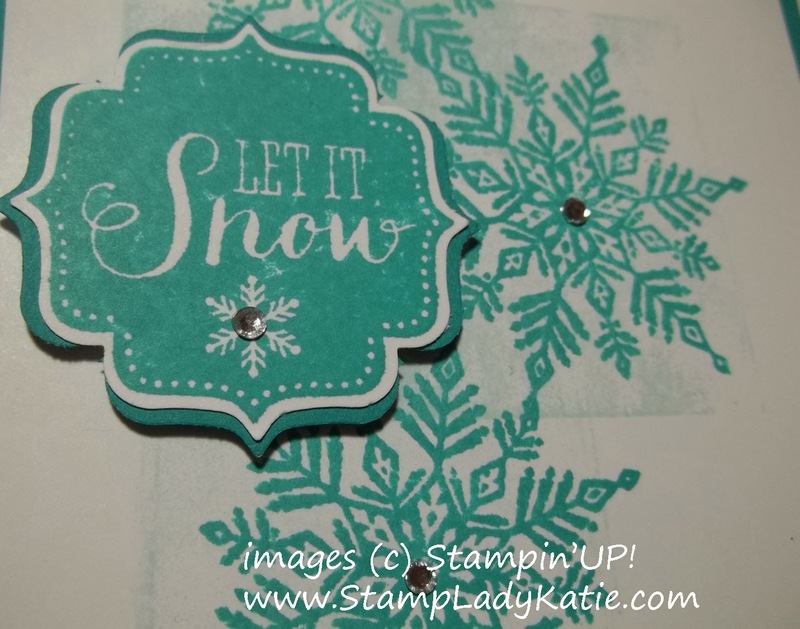 One for the center of each snowflake on this card, including the snowflake under the sentiment. 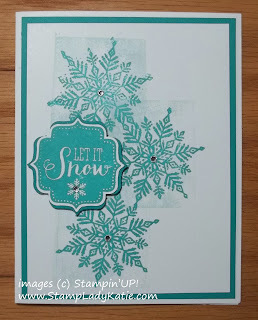 Given the massive amounts of snow we've had recently a card with snowflakes seemed the perfect post. This snowflake image and the sentiment are both part of the Best of Snow Collection. Other images in this collection include the cute Hedgehogs and a darling little Snowman. Notice the punched layer with the sentiment? There's something special about that. It was made with the Bracket Label punch - which there's only 1 size of. Yikes I can hear my high school English teacher telling us not to end a sentence with the word "of". But anyway, the punched piece is in 2 layers! Cool trick, huh? Watch this little video showing how to get 2 different size layers from 1 punch. Want more tips like this? be sure you're signed up for my email list. On Thursday I'm sending out a pdf with copies of 6 Technique cards that my downline made at our meeting this month. Consider this a Holiday Gift from me to my Newsletter subscribers. Huge Clearance Rack Blitz Starts today. Some items are marked up to 80% off! 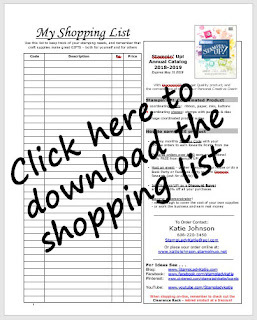 Shop here for all your stamping supplies.